DO-90080-11 was succesfully added to your cart. Will this thermometer capture the min and the max temperature over a 48 hour period? We would like it to track ambiemt temperature when prople are out on the weekend. The range would be 15C to 25C. disable this automatic memory reset feature. Will this thermometer store temperatures for longer than 24 hours? Our facility is open 4 days a week and we need to see if there has been a temperature excursion during the times the office is closed. is not possible to disable this automatic memory reset feature. I am looking for a small thermometer to put in a -20 C freezer. I just want to be sure that this thermometer is capable of measuring temperatures that low. Thank you. The range of the temperature readout will go down to -25C, it has an insulated read-out so when you open the freezer you should still be able to read the display. 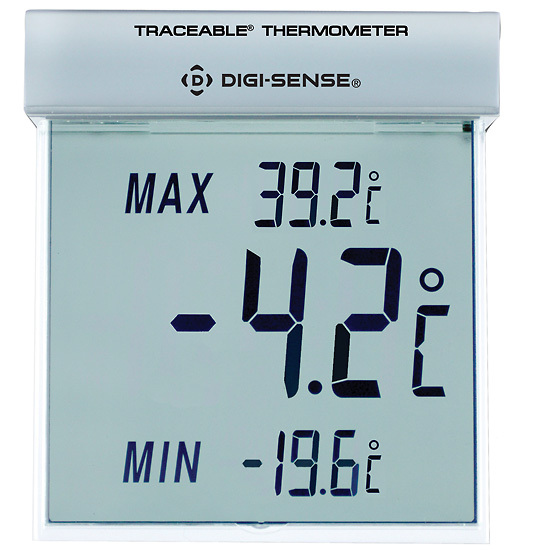 This thermometer has to be in the environment to take a reading (and kept from moisture collection), so if you do not wish to open the freezer in order to read the temperature another meter may be more appropriate. Please call for additional assistance. The segments are certainly large enough but the plexi coating has a grayish hue, and unless you are directly infront of the display and within 0.5m it cannot be read. Certainly not suitable for use in a room. The picture in the catalogue has been enhanced. This thermometer is thin enough to not be in the way inside a refrigerator. Attach it to the wall on the door hinge side so you see it each time the door is opened. It teaches one how quickly the refrigerator loses temperature when one is in and out of the refrigerator often, especially during the summer months. It shows the high and low temps each 24 hrs. It can be installed outside a window. Very large digits for the seniors with senior eyes. I love a good refrigerator thermometer and you can count on it being accurate, as well the ability to send it in for calibration every few years. This product is priced right, looks good in the lab, is easy to read and provids accurate ambient room temperature measurements required by the lab certification agencies. Easy to read. Simple to mount. Accurate and not very expensive. We use these for ambient temperature measurement in the lab.